Jim Peterik's career has spanned five decades as a consummate composer and performer. Peterik has been responsible for many unforgettable songs that have sold millions of albums worldwide and garnered numerous awards, including Grammy and Oscar nominations. As founding member of Survivor, Peterik and the group's songs "Eye Of The Tiger" and "The Search Is Over" have become modern classics and instantly recognizable. This is the 17th consecutive year Peterik will mount his now legendary World Stage shows. Peterik will once again bring this event to Wentz Concert Hall, and it promises to be another powerhouse of hit songs, virtuoso playing, stunning vocals and unexpected twists and turns. 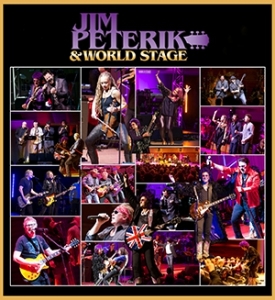 World Stage began as a CD of Peterik exploring new styles of music, written and sung with some of his friends and colleagues. The template was cast by having Peterik and his guests perform their collaborations, along with their own hits in front of Peterik's handpicked band, featuring the hottest and most versatile musicians he could find. The celebrity lineup for the show this January will feature a premiere performance by Mark Farner of Grand Funk Railroad fame, Dave Bickler who sang Survivor's greatest hit "Eye of the Tiger", Colin Peterik, Toby Hitchcock, the Ides of March, and 2 surprise artists! Hurry and get your tickets before this one of a kind concert sells out!